This lady with a big, sweet smile is Eliafura. 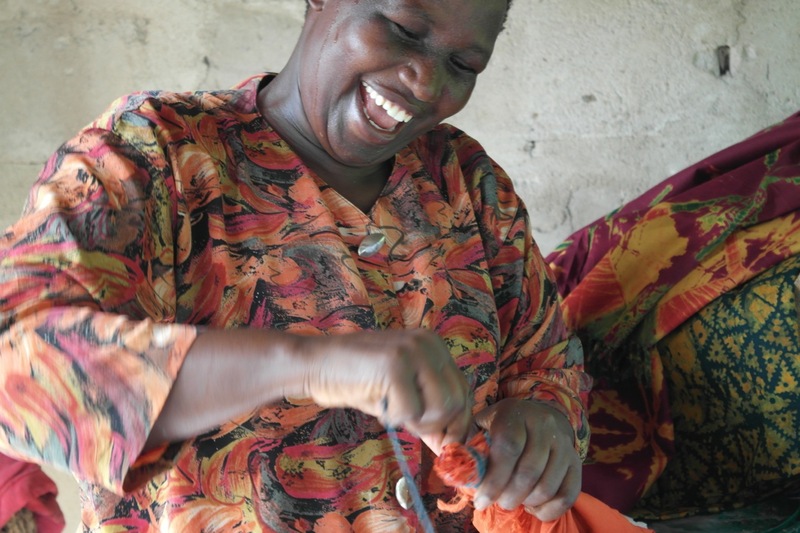 She lives and works in Tanzania, making beautiful batiks and tie-dyed materials. With the support of The Gatsby Trust – an organisation funded by Sport Relief – Eliafura has registered her business and learned important health and safety rules around the chemicals she uses. She also now trains other women in her village – they bring her material and she teaches them how to make the colourful patterns. Eliafura’s fabrics sell well, both locally (especially in nearby schools, where teachers like to buy them) and overseas. This photograph of Eliafura is my ‘digital postcard’ from my friend and fellow blogger Annie at Mammasaurus. Annie is currently in Tanzania with Tanya from Mummy Barrow and Penny from The Alexander Residence, visiting projects and learning about the different ways Sport Relief donations have helped create female entrepreneurs and lasting change for women, their families and communities. Annie tells me that the three bloggers – known collectively as Team Honk – bought Eliafura’s entire stock because they fell so much in love with it, and they are now working out how to sell them on so they can complete the cycle of donation-funding-training-selling-donation. What better way could there be to mark International Women’s Day 2014 than by celebrating inspirational women like Eliafura, and the opportunities for lasting change that Sport Relief have created? There is so much more information about the work of Sport Relief on the Team Honk website here. Over the last couple of month, bloggers across the UK have been taking part in a baton relay that so far has raised over £22,000, which is just incredible, and I’m so sorry I can’t be there to be a part in it. I am cheering them all on from Tasmania! Dozens of other bloggers have also received a digital postcard, so if you’d like to read more inspiring stories like Eliafura’s, please check out the gallery here. And if, after that, you’d like to help support Team Honk and Sport Relief there are a number of ways you can do so. SHARE – Please RT, share and support any updates you see on social media with the #lastingchange hashtag. GET INVOLVED – Join up for your local Sport Relief event here. So lovely and thank you for posting Ruth.How lovely is that big smile? Suns it all up! No wonder she looks so happy! But then that’s what has stood out for me in all these photos – just how positive and happy these women look. And what gives me goosebumps is that they are achieving exactly the same as women are trying to achieve the world over – to earn a living whilst being there for their kids. This whole trip has had such an air of optimism. I know there is still so much to do, and thousands are still struggling, but the money we are raising is making such a big difference, it inspires you to carry on, doesn’t it?